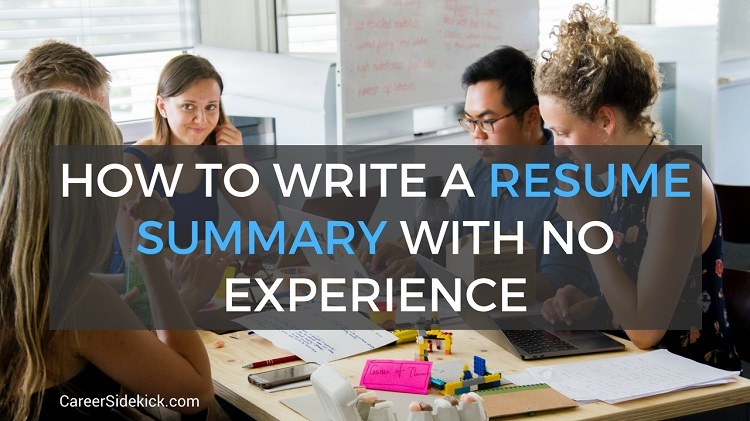 If you’re looking for how to write a summary for your resume with no work experience, you’ve come to the right place. I’m going to walk you through exactly what to do, and then we’ll look at resume summary examples for entry-level job seekers, students and fresh graduates. Okay, first- a summary is different than an objective. Usually resume objectives are useless because they don’t share anything the hiring manager doesn’t already know (such as “my goal is to obtain a position in the ___ industry”). So what we’re doing here is better and will help your resume stand out from people who simply put an objective. If you’re not sure what a resume summary actually is, check out this article on 10 resume summary examples. But we still have the original problem: What do you put? You don’t have any work experience, so what goes on your summary? What did you study? Did you just graduate with a degree? Mention that. If you took a leadership role in your class projects, or clubs/groups at your school, you can mention that too. Leadership doesn’t need to be in a job to get the hiring manager’s attention! Taking a leadership role in a sports environment is impressive as well. You’re not going to mention specific accomplishments in your resume summary usually (you can do that later in your resume), but you can say things like “proven leadership” or “natural leader”, etc. Are you passionate about startups and technology? Great, put that. Want to make a difference in the world, and focus your career on social impact? Mention that. This can include the grades you received, but also leadership positions you led, and clubs/groups you participated in. If you’re proficient in any tools, technologies, etc… you can include that in your resume summary. Don’t list 20 things. That’s what your “Skills” section is for. But pick the three or four things that are most relevant for the job you’re applying for. Coming up in this article, we’re going to look at two resume summary examples for people with no experience... and in the second example, you’ll see how this would look. Are you great at analytical thinking? Do you love working as a part of a team? Are you great at multi-tasking and handling a fast-paced team environment? While this shouldn’t be the main focus of your resume summary section, these can be worth mentioning. It’s especially good to include soft skills if you see them mentioned on the job description. For example, if you see they mention wanting someone who’s great at multi-tasking in a fast-paced environment, and you feel that describes you well, then your resume summary is the perfect place to include this. 5. Put statements that will grab their interest and make them want to ask you questions! If you mention leadership they’ll want to ask you more about your leadership experiences. That’s a good thing. Remember, whatever you put, they’ll probably ask you about. So as you write your summary for your resume, try to think about what you want them to discuss with you, and what you want a chance to talk about. And try to “tailor” your resume to fit the companies you’re applying to. If you’re applying to large corporations don’t start your summary by saying “Startup enthusiast”. Enthusiastic, highly-motivated Economics graduate with proven leadership capabilities, who likes to take initiative and seek out new challenges. So in this case, you’re showing that you completed your Economics degree and have an interest in the subject, and you’re mentioning leadership and making the reader want to learn more about this. You’re also making yourself sound ambitious and motivated at the end, which is always a good thing (I’m referring to the part that says “who likes to take initiative and seek out new challenges). Notice the format too. This is how I recommend phrasing it. Don’t say “I am a ___”. Just start with the descriptive words. Computer Science graduate passionate about data engineering and machine learning. Highly-capable leader, having led multiple Senior class projects to completion. Proficient in a range of modern technologies including Python, Java and Scala. In this entry-level resume summary example, you’re highlighting accomplishments and leadership as a student and you’re also showing what you’re passionate about doing. They’ll know you’re looking for jobs because you applied. Taking up space to say it is a bad use of this area of your resume, and is why I never recommend having a resume “Objective” section. The summary is instead of that. The example above also included some great programming keywords (Python, Java, Scala) to help get past any automated application systems and grab the hiring manager’s attention very quickly when they first look at your resume. If you work with any tools or technologies that have names like these, you can include it in your entry-level resume summary if you’d like. Other examples of tools/technologies: Photoshop, MS Excel, etc. If you decide not to include these on your resume summary, make sure to include them elsewhere such as your Education or Skills section. Include statements in your resume summary that will catch the employer’s interest and make them want to talk with you and ask you more. Remember – the entire goal of your resume is to get invited to interview. So if you did anything unique like giving presentations, working in an internship, participating in a school club, etc., you can include this in your entry-level resume summary. If you follow the tips above you’ll have a great entry-level resume summary that will stand out and catch a recruiter’s or hiring manager’s attention so you can get more interviews.